This story has been updated with comments from the Postal Service. The Postal Service has increasingly missed its own delivery deadlines in 2015 despite loosening them at the beginning of the year, according to a new report. Delayed mail processing increased 48 percent in the first six months of the year compared to 2014, the USPS inspector general found in a recent alert to management. The IG partially blamed a harsh winter; delays have decreased each month since January. Such dips were also present last year, however, and the gaps between 2014 and 2015 delivery have persisted consistently month over month. USPS management knew the closures would impact delivery times, and at the beginning of the year instituted new standards to create expectations of slower processing. 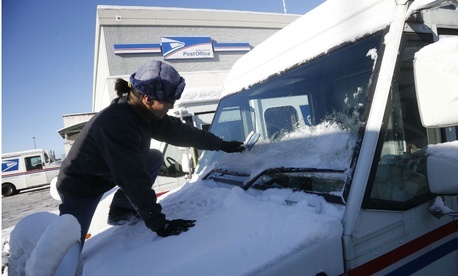 The Postal Service eliminated overnight delivery of single-piece first class mail, and shifted much of its two-day service to a three-to-five day window. Through the first half of 2015, the agency is failing to meet even those revised standards. One such unanticipated issue was the effect on the workforce; as the Postal Service changed its delivery schedules and rerouted mail to different processing centers as previous destinations closed, the agency had to get employees to work different hours. USPS failed to get the proper number of workers into the appropriate timeslots, the IG found. The Postal Service has required some employees to forfeit differential pay, as they transferred from night shifts to day shifts. It also expects to transfer 15,000 workers to new locations and shed 7,000 jobs when it completes the second phase of its consolidation plan. Upon its completion, that segment of the plan will see 82 facilities close, in addition to the 141 shuttered during the first phase. Phase two was scheduled for completion originally in 2014 and again in 2015, but the plan has been pushed back indefinitely. Postal management cited the need to stabilize operations and provide “prompt, reliable and predictable service” as the cause of the delay. The agency has already taken some steps toward that end, sending teams to 20 sites to identify and fix problems causing delays. USPS has also boosted transportation infrastructure to alleviate the problem. "We remain totally committed to identifying and correcting errant processes in our operations as early as possible," he said, noting management has already taken several steps to fix the situation. "We will continue to implement additional efficiencies, as needed, to maintain the service our customers expect." Still, the IG recommended the Postal Service cease all consolidation and optimization efforts until management establishes “criteria for determining if the network has stabilized” and ensures the criteria are met. Postal management disagreed with that suggestion, saying the agency will continue to introduce changes to individual facilities to streamline delivery. In its evaluation of that response, the IG said the Postal Service was making a bad choice. USPS has not put forth a new timeline for the consolidation plan other than saying no more closures will happen this year.